‘Have you seen that dog with the stick injury?’. I was starting to get edgy because I was still finishing up a procedure and was now dieing to see what the whole fuss was about. Suddenly I was equally captivated and silenced by the image of this placid German Shepherd with a decent sized stick hanging out of his eyeball while he was placed in a cage in front of me. For those of you who can’t stomach any real gory images then I recommend you refrain from reading the rest of this blog as it is full of such images. 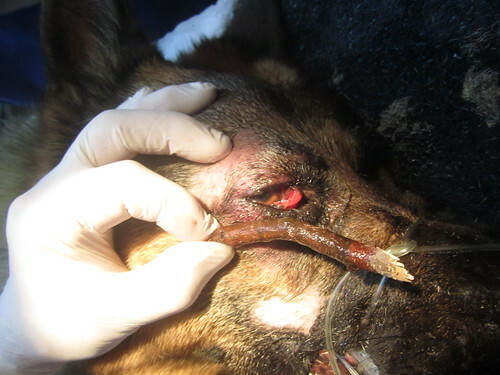 Ian, my vet colleague, immediately gave ‘Major’ a sedative/premed without examining the severity of the stick wound. There was no reason to poke and prod the patient until he was under full general anaesthetic. Ian, however, had to explain to Major’s owners that based on his quick assessment, ‘Major’ was most likely going to require an eye enucleation. This is ‘Major’ when he was first admitted and given his sedation. I happened to be loitering around and actually had some free time to closely observe the whole procedure. 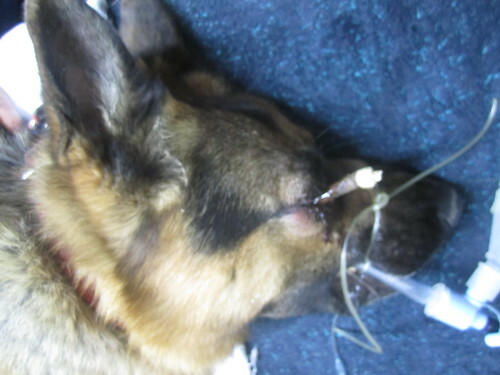 They put Major under full general anaesthetic shortly after he was sedated. Major had just been induced with IV alfaxalone (induction agent) at this stage and was going to be intubated next. Finally the moment of truth, Major was intubated and anaesthetized. It was time to fully assess his horrific stick injury! Close up of the STICK IN EYE! Don’t ask me how but Ian did a terrific job and managed to pull the stick out carefully and without any major complications. The stick had miraculously not punctured Major’s eye globe but instead managed to wedge itself between the eye globe and socket!!! 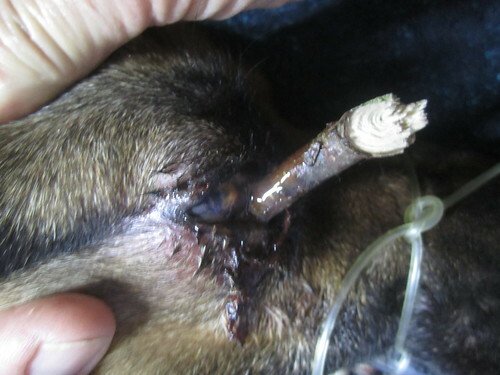 This image was taken after the stick had been removed and illustrates how much of the stick had been lodged within Major’s eye socket. Ian then vigorously flushed the involved site and even infused antibiotics into it to prevent the formation of an abscess. The whole eye was severely swollen and had a constricted non-responsive pupil. At this stage, the viability of the eye was in serious question but it was worth trying to save it. 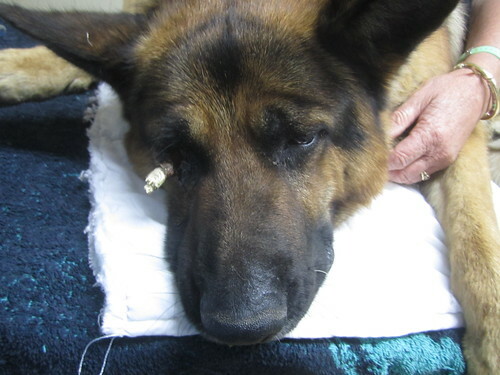 Ian then performed a 3rd eyelid flap to protect Major’s eye. Major the day after his procedure with his 3rd eyelid flap. 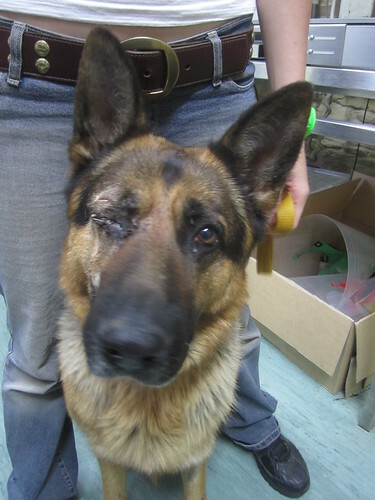 While Major has made an excellent recovery, the outcome of his injured eye is still unknown. This week, we will be reversing the 3rd eyelid flap and fully assessing the functionality and viability of his eye. In this picture, you can see Major is such a softie; shaking hands in the hope of getting a liver treat. Major is one of the sweetest German Shepherd we have ever met. Let us keep our fingers and toes crossed for a really good outcome. Those kind of accidents get you thinking, don’t they? Would you play fetch a stick with your dog after reading about this case? Personally, I prefer my dogs chasing a bouncing ball over a stick. However, it is important that we all remain reasonable and realize accidents do happen and so we don’t want to get overly paranoid. Good luck Major – you’re in great hands! Hope you’re one lucky boy and do have two working eyes. Thanks heaps. We are very hopeful about Major. Wow. but I’ve seen a kid with a stick in her eye. Hope he recovers and has a great life. Hey Sonia. I can’t believe you saw a kid with a stick in the eye. I hope that ended well. Oh, my gosh! I hope his eye is okay! I have always been squeamish about dogs fetching sticks. I’ve seen them wedged in all sorts of ways in the mouth over the years (and we once had one that was punctured through the trachea… it did not end well), but never through the eye socket. What a bizarre case. I hope the eye comes out okay, please keep us updated! Hey Lyle. You are right, stick wounds don’t always end up well. We hope to get a good outcome with Major. I will definitely keep you posted. …… i don’t know what to do …. am scared & i need urgent help ……. Dear himanshu. You must take her back to your vet or find another one. If she has haemorrhagic gastroenteritis, she needs to be fasted for 48 hours and put on an iv drip and iv antibiotics. Unfortunately I can’t give you ant mire information because I haven’t examined your dog. Hope she or he gets well soon. I would of never thought that something like that could happen just by playing with a stick, luckily my dog loves her ball, and goes wild over frizbees. I wish Major the very best of luck, and hope all goes well. We are actually not sure exactly how Major contracted his injury. We assumed he was chasing a stick. Oh my this was really hard to read and view as I love all the animals so, very informative and a great warning. Will you keep us updated to the status of Major? Lucky dog to have you as the vet. I totally understand how hard it must be fir you to hear about an animal suffering from pain. I will definitely give you a progress report in Major later thus week. Major was lucky I guess, in that the stick didn’t actually pierce his eyeball.. I hope the eye recovers completely and his sight isn’t affected, but I know he is in good hands. Please keep us updated on his progress Rayya. Thanks Barb. 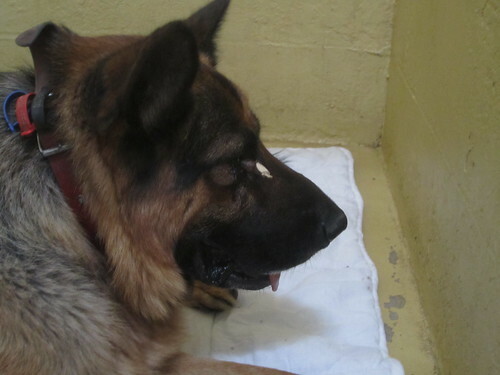 Major is very lucky and let’s hope we are able to save his eye. An exceptional remedy for Major, hoping the optic nerves weren’t damaged. Your case write-ups and photos are always great. Thanks for linking to the post on the rescue Danes. There are rescue groups world wide for almost all breeds, it always helps to get the word out to so we can hopefully keep a few animals from just being abandoned. Looking forward to your next write-up and photos of a case………..
Hey cowboy. I totally support your passion to spread the word about all these lovely giants looking fir new homes. I will keep in sharing those cool cases. I know anything can go wrong but looking at this I am so glad my boy prefers playing fetch with stuffed toys 😦 poor Major, I hope he recovers well and fast. In saying that though my boy has ripped one of back nails & it’s hanging off at the moment, so even self inflicted wounds are just as bad! Hey Britt. Those cheeky pets manage to always get themselves into trouble. Hope your pooch recovers soon. Wow! I know things like this can happen, but it’s really shocking to see it. I certainly hope this sweet dog can make a full recovery. I don’t throw sticks for my dogs but my Border Collie does run around looking for sticks to pick up. You can bet I’ll be a little more paranoid about this habit after seeing these photos. Hey Kim. Border collies and kelpies are notorious for chasing sticks. 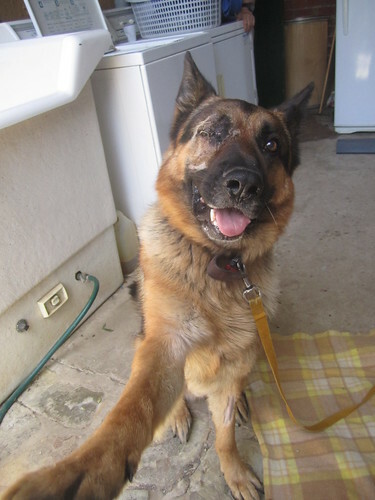 Major is hopefully going to preserve his eye. You do the most amazing job – I hope he makes a full recovery. Thank you so much for your link under ‘Latest Good Reads’! Much appreciated. Hey Jo. Thanks :-). Keep up the great blogging. I worry about stuff like that with my hunting dog, who is always bounding through fields and brushy areas. Good job, though, getting the dog all patched up. Poor, poor big guy! Ouch! Hopefully he is not feeling any more ouchies. I did have to scroll the pictures, 🙂 but I have heard of that injury with hunting dogs. Poor guy! I couldn’t bear the images (kudos to you for having the stomach to take them and help your injured patient), but I enjoyed reading about the procedure. I’m glad there are caring, hard working folks out there like you and your team! Hi Dr Rayya, Major is an amazing dog,( having known him for some time),,,,,,,you have made Debbie and Geoff very, very happy folks, thank you for your efforts in making him well, keep up the extraordinary work. wishing you and your team all the best. Hi there – Major is my mum’s dog and I just wanted to take this opportunity to commend you on your service. He is a beautiful boy and was indeed very lucky. I’ve spent this week at my mums house and can report that he’s doing really well. He was lucky to be in such caring and skillful hands. Not all surgeries would have provided the love and support you have. I myself have a 18month golden retriever and an older ginger long haired cat. I know how important it is to have a vet you can trust in – and luckily Major was in good hands. Thanks for investing your time and efforts in him and his speedy recovery. Hey Mel. I am feeling very humbled by your very kind words. Major is such a sweet boy and was a brilliant patient. He was so trusting and allowed us to do our jobs to the best of our abilities. My colleague Dr. Ian Anderson did ace work for sure and our whole team fell in love with Major and wanted to ensure his speedy recovery. We are thrilled about being able to save his eye! Dr. Rayya, thank you for sharing this story. I’m so glad that Major is doing better. I am actually working on a fun post about my dog playing with a stick but will link to this post to emphasize the importance of supervising dogs with sticks (and of course, other toys). Praying for a speedy recovery for Major! I was there when we released him – I was amazed at the stick and at how sweet he was! Hey Deb. I totally agree. German shepherds are so sweet and need to trust you. U have personally treated many without ant issues; even those that other vets gave been unable to. I find positive reinforcement training e.g. Loading up my patients with yummy liver treats, a brilliant approach. Big props to all owners if German shepherds that are well behaved and obedient. Whoa! That poor dog. He looks like he was a wonderful patient though. I love German Shepherds…and he looks like an especially good one. So happy Major is feeling better now– this looks like a terrible accident. Thank you for sharing this story— I’m glad you were able to help him! Thanks for stopping by my blog today and liking it. I look forward to following yours! I hope all turned out well for this sweet dog! Glad to hear Major is okay. My dad’s dog once got a stick stuck in his windpipe and we had to pull it out. It was amazing that he wanted to run for it straight after! He replaced the stick with a ball in a sock shortly afterwards! Hey Jason. Dogs are pretty halarious that way-they never learn from their bad experiences. Glad your dad changed over the fetching item. Poor Major. I hope his eye heals okay. I am so happy to hear that. He is a beautiful animal. My Midnight(Pocket Pit) is crazy about sticks. Sense I have woods as part of her yard I don’t think I will ever be able to keep them away from her. However my dog Felix (not with us anymore) had a accident with his ball where I had to run him to his vet. I threw his ball and it went past my landscape trailer and instead of going around like he usually did he tried to go under and he hit a corner of the trailer and opened up just above his eye. It was very deep wound and recommended not to stitch up. So wound would not heal from outside in. Felix healed very well . I never let him go around that trailer again because in the excitement of fetching his ball he didn’t even think and ran into the trailer. Felix was ball crazy as Midnight is with sticks. Afternote: Felix lived a Happy life and passed at the age of 15 years. I had him sense birth. He died from a stroke in my arms at home.My Gravatar pic is Felix. Hey Sassy. Thank you so much for sharing your very personal experience and telling us about what happened with your much loved and late Felix. One of my dogs is ball crazy too and will simply do anything to get the ball (even walk through fire). I hope Midnight’s stick obssession does not cause any issues. You can always try to find her a toy that drives her nuts and hopefully you will divert her attention to that. I have been trying she likes all things play! I have been taking the sticks away and putting them high up in bushes where she can’t get them. She tries for a while and realizes she can’t get them and moves on to something else. Not hard here with all country life provides for a active dog.Midnight is my rescue from NYCACC Former Manhattan girl turns country girl.She was on the TBD list and I put in to be her foster just in time. I am now a foster failure as I have sense adopted her. So seeing her run,play and just be a happy dog is a great feeling. I love your blog Dr. Rayya. Thank you! PS I’m so glad Major recovered! I love the last photo of him. Free recovered too and had a great life for many years! Dogs have my heart.